Nothing expresses the dynamic of the show better than the image above. Together, yet distant, is how the relationships in the royal family feel like. Not only among the parents and their children, not just between the siblings. But most importantly, between a wife and a husband. The Crown does a brilliant job at delivering one of the most important history lessons! All while keeping the integrity and the intrigue well contained in a binge worthy package. First of all, I would like to admit that I’m not much of a period drama kind of gal. Sure, I have enjoyed a bit of Downton Abbey, have binged the first season of Outlander like a mad woman, but that’s where my interests have stopped. Period dramas are something that I need to be in a specific mood for. And as you might have guessed from this post, that mood hit me recently and I binge watched The Crown’s first season. Before watching it I had only heard good things. Sofia from Returning Videotapes praised its soundtrack and the show itself. Plus, seeing Claire Foy win a Golden Globe for her portrayal of Queen Elizabeth II gave me the confidence to finally tune in. Now I almost regret it, because I hate it when I’m so late to the fan-wagon. The Crown’s plot follows the historic events and some of the more notable moments in British history. Season 1 begins with Elizabeth (Foy) being wed to Phillip (Matt Smith) – a controversial marriage from the beginning. A year after their marriage Prince Charles is born, and 3 years later Princess Anne. Then Margaret and Phillip travel to Africa instead of the King, since he is more ill every year. In the middle of the journey she finds out her father is dead, and she has inherited his place. Her life changes in an instant. Now her life is not driven by her title of a daughter, a sister, and definitely not, as the one of a wife – but the title of the Queen. Though it would be hard to spoil a historic plot, I will still rather not spill the beans about everything that happens in the first season. Rather than read about it, I recommend watching it for yourself anyway. But I will discuss about some of the show’s aspects. For instance, The Crown does sometimes feel slow paced. Then again, the slower progression feels authentic for the time period. Most importantly though, since the show takes its time to tell the story, we start focusing on the smaller details. One of the strengths of the show is its cast, and that cast is able to shine brilliantly. Foy is as strong not just with her dialog and her accent, but she ensues queen-like qualities in the silent moments. For instance, the way Elizabeth finds out her father is dead is simply through a look Phillip gives her, and you can feel her pain in an instant. There are many kinds of looks between these two characters, many that have much more importance. But that specific look Elizabeth gives Phillip (and vice versa) is filled with so much meaning – it breaks your heart. The rest of the cast is as noteworthy. Vanessa Kirby as Elizabeth’s sister Margaret is exciting to watch. While her character is intriguing and rebellious, Kirby’s acting is even more out there. She holds herself differently than others because her character wants to break free. In other words, I’m now very curious to see Kirby in the upcoming Mission Impossible film. John Lithgow as Winston Churchill was interesting but I seem to have a very non-emotional reaction to Churchill in general. My feelings for this famous figure in British history didn’t change with The Crown. Let’s quickly discuss the power dynamic of the characters in The Crown. I’ve mentioned Elizabeth’s titles a few times now and it’s because this is what I love the most about the show. Yes, Elizabeth is the Queen, but she is so much more than her royal title. She is also a daughter and a sister, though both contradicting titles as well. Her mother, Queen Mary (Victoria Hamilton), is very by the book. She believes in the monarchy, she follows the rules, and she expects such from Elizabeth. Princess Margaret is the opposite, so her title as the sister is conflicted by love for ones sibling and being the Queen. Most complex dynamic is the one between Elizabeth and Phillip. The first season focuses on their relationship the most and it’s probably, and pardon my choice of words, the most juiciest aspects of the show. There are moments their love is tested, there are moments when the presence of love is questioned. And then there are those small glances from Phillip, that convey so much admiration and fear. Because while men were and still are considered the leaders, Phillip is forever the follower. He will come second, because the Crown, will always come first. As for the production – it’s hard not to notice where all the money went! There is no weak link, from costumes to production design, from locations to the archived footage. It looks like we are watching history happen in front of us. But, honestly? The cost of each episode is so high that it makes me wonder, is it really worth it? And then I watch an episode like Act of God (the fog! ), and I’m okay with that amount of money if it’s spent so well. That episode was probably the highlight of the season for me visually as well. I also have to talk about latest controversy surrounding the show. Shocking many, we found out that Foy had a smaller pay-check. The Internet raged. Meanwhile I was sitting there and thinking, but it makes sense to pay Foy less. Does that make me a bad person? No. It makes me a realistic one. Claire Foy, before her role as the Queen, was not a well known actress. Matt Smith had been the Doctor and he was the “name talent”. Of course now, two years and a Golden Globe later, Foy is the “name talent” and perspectives have changed. But I’m quite sure she didn’t mind the smaller pay-check in the beginning. Besides, knowing the cost of the show, I’m pretty sure she got a very nice sum for her portrayal of the main character. Anyway, those were just a few of my thoughts about the show’s first season. I’ve yet to finish the second season but I’ve already started. When I finish I will definitely discuss it too. Have you watched The Crown yet? If yes, share down in the comments what was your favourite episode of the first season! This is so cool, I just watched two seasons this week! To me Smith is not a ‘name talent’. So he played Doctor Who, big deal. Geeks know him but that’s it, far more people know who John Lithgow is than who Matt Smith is. Foy should have been paid more as a lead actress in the show. Also he creeps the living hell out of me. He is a decent actor but that’s about it. Foy and Kirby are wonderful throughout two seasons and Lithgow was just amazing, that “Assassins” episode with him tearing up listening to Elizabeth’s speech was such a lovely episode/scene. I still need to finish the second season. I’m liking the second one even better though. I think Smiths name in the beginning was still more known, I don’t watch Doctor Who, but I still kept seeing his name and face everywhere. Foy came out of nowhere for me, but I understand both point of views at this point. It’s just a very complicated matter yet again. By the way, Smith kind of works for me. I know weird, but he is especially appealing as Phillip, something about his demeanour that just gets to me. Lithgow was good, definitely a lot more praise worthy that Oldman’s Churchill (which I’ve only seen clips of). 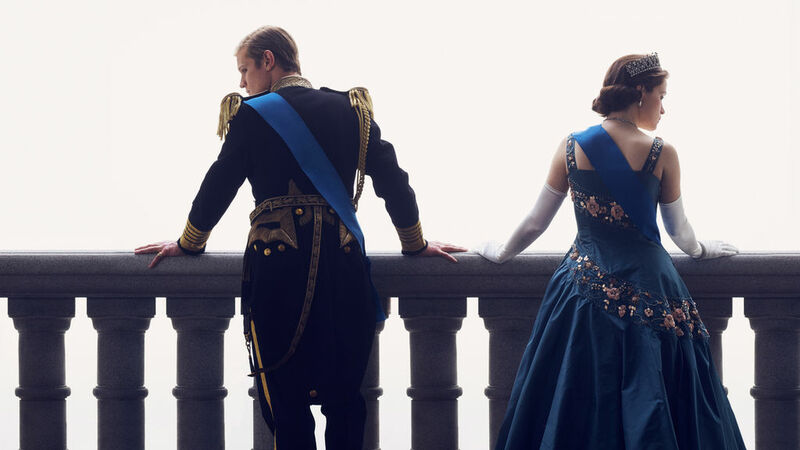 I don’t usually watch period pieces, and I wouldn’t have watched this if I wasn’t in the same room with my mom (she likes shows about royalty). I was very impressed with the production, and eventually watched the whole season with her; I even texted her that season 2 was out and we could start binge watching. Claire Foy was really good here, and I want to watch Vanessa Kirby in everything after watching her performance here.